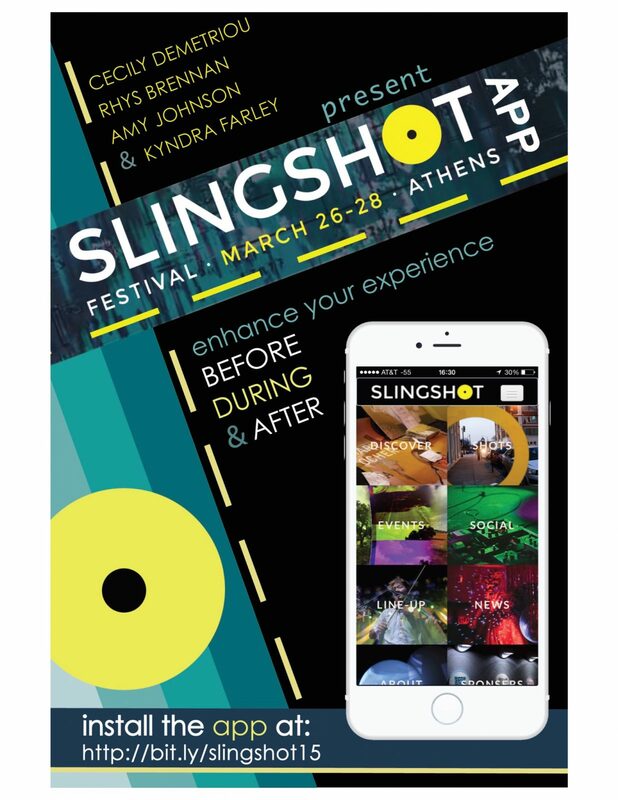 Slingshot is a one-of-a-kind a music, electronic art, and technology festival that takes place in Downtown Athens. This festival pushes boundaries and exposes festival goers to ideas and experiences that are truly unique. The few short days of the event are full of international, national, and local acts on stage, artworks throughout the urban environment, and tech talks with leading innovators. The problem that arises from all of this activity, though, is that festival goers are not aware of all of the opportunities open to them, and leave the festival unclear about what they witnessed. That’s where the Slingshot Festival app comes in. The app provides communication, info, and additional activities to help festival goers make the most out of Slingshot. Equip: The Slingshot Festival app enables festival goers to equip themselves for their upcoming experience. Want to know what bands will be playing? Are you curious about the background of the artwork you’re going see and tech talks you’re going to hear? Through the app, you are able to browse the 80+ bands, 40+ artists of sound, video, and installation, and the leading innovators that are showcased at the festival, and create a personal schedule beforehand so that you don’t miss out on an awesome show or presentation. Enhance: The Slingshot Festival app enables festival goers to enhance their experience throughout the few days Slingshot takes place. Festivals can become overwhelming and chaotic extraordinarily fast due to confusion about event times, places, and changes in the schedule, but they are also a time to connect with new people and share cool experiences with one another. Through the app, you can access an up-to-date schedule that will let you know if any details about an event have changed so that you never miss a beat. You are also able to access social media like Twitter, Instagram, and Facebook so that you can explore fellow festival goers’ experiences at Slingshot and maybe even meet a new friend or two. Extend: The Slingshot Festival app enables festival goers’ to extend their experience even after Slingshot has come to an end. The first activity you’ll want to do once the weekend ends is probably catch a few zzzz’s. Once you return back to the daily grind, though, you might realize that you really liked that one band you heard on Saturday night, but you can’t remember their name. Or maybe you really liked a piece of artwork, didn’t want to buy it at the moment, but now you can’t live without it. Through the app you can go back and look at what bands you saw, artworks you enjoyed, and speakers you learned from, and then easily download some new tunes or invest in new artworks. Also, get your Slingshot fix throughout the year through smaller Slingshot sponsored events that will be promoted on the app.